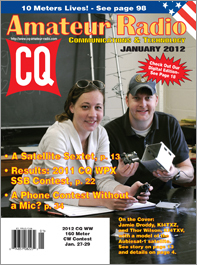 The January 2012 issue of CQ starts out at the launch pad at Vandenberg Air Force Base in California, where a group of six cubesats (four of which operate in the ham bands) developed by students at four different universities was successfully launched in late October. "VHF-Plus" editor Joe Lynch, N6CL, leads us through the history of these satellites as well as their missions and connections to the ham radio community. This issue's cover photo highlights two students who were leaders of the team at Auburn University that built AubieSat-1, now OSCAR-71. Next, we have the SSB results of the 2011 CQ WPX contest, with top honors going to 8P5A (W2SC op. ), CN2R (W7EJ), TI5N (W8QZA), ER4A (UT5UDX), JY5CC, ST2AR and 8P3A (VE3DZ) in the various single-op categories, as well as multi-op stations 3V1A, EA8AH, DR1A and 3D2A. We've also got the rules for February's CQ WW WPX RTTY Contest, and for phone contesters who really don't enjoy the strain on their vocal cords, we've got "Who Needs a Microphone for a Phone Contest?" by Jamie Dupree, NS3T. The nominating period for 2012 inductees into the CQ Amateur Radio, Contesting and DXing Halls of Fame opens on January 1 and closes on March 1. The official announcement is in the January issue, and the nominating form for the Amateur Radio Hall of Fame is here on our website. January 1 also marks the beginning of a brand-new CQ DX Marathon. Everybody's slate is wiped clean and we all start from scratch. Click here for the 2012 Marathon rules. Remember to submit your 2011 log by January 31. Moving to our columns for this month, we already discussed "VHF-Plus" up at the top. In "Math's Notes" column editor Irwin Math, WA2NDM, wraps up his series on operational amplifiers (op-amps) that he began in December; "Washington Readout" editor Fred Maia, W5YI, previews this month's World Radio Conference that has the potential for creating a new ham band around 500 kHz but could also endanger the 60-meter band; and Magic in the Sky" editor Jeff Reinhardt, AA6JR, offers his opinions on how protests against automated utility meter reading could turn into anti-ham radio protests as well. Public Service Editor Richard Fisher, KI6SN, looks at how one SKYWARN organization is effectively using social media to provide information to members and expand its reach; "Learning Curve" editor Rich Arland, K7SZ, offers a tutorial on "Safety in the Ham Shack," and Kit-Building Editor Joe Eisenberg, K0NEB, looks at "An Open and Shut Case." 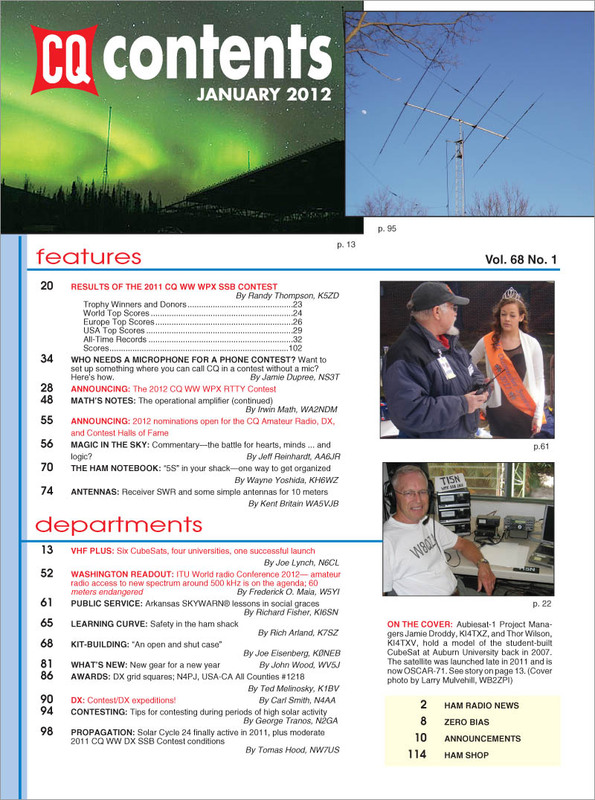 "The Ham Notebook" by Wayne Yoshida, KH6WZ, applies some corporate principles of getting and staying organized to the ham shack; Antennas Editor Kent Britain, WA5VJB, looks at receiver SWR and offers plans for some simple 10-meter antennas; New Products Editor John Wood, WV5J, checks out some "New Gear for a New Year;" and Awards Editor Ted Melinosky, K1BV, looks at grid square awards. DX Editor Carl Smith, N4AA, checks into some contest DXpeditions; Contesting Editor George Tranos, N2GA, offers tips contesting during periods of high solar activity, and Propagation Editor Tomas Hood, NW7US, notes that Cycle 24 has finally woken up and is heating up the HF bands. That's a brief look at what's coming up in the January issue of CQ magazine, which should be on newsstands and in subscribers' mailboxes by early January; and available online to digital subscribers on or about January 1. For information on becoming a CQ subscriber, "Click Here!" Happy New Year from all of us at CQ!